Joseph Irungu (second, left) and his girlfriend Jacque Maribe (second, right) in court on October 17, 2018. 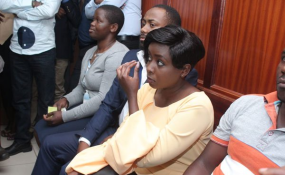 Nairobi — Citizen TV journalist Jacque Maribe and her fiance Joseph Irungu alias Jowie are expected back in court Wednesday morning for the mention of a case they are charged with Monica Kimani's murder. They two are set to be informed when their application for bail will be heard. The two were Monday charged with the murder of Kimani in her Lamuria apartment in Kilimani area but they denied the charge. Two lawyers Danson Omari and Katwa Kigen will be arguing before Justice James Wakiaga on behalf of Maribe while Cliff Ombeta will be representing Jowie in the proceedings. The prosecution had objected the release on bail of the two on grounds that they could interfere with investigations. In an affidavit filed at the High Court, his afternoon, lead investigating officer Maxwell Otieno said, there was a high chance that the two could jeopardize ongoing investigations into the murder of Kimani. Otieno said investigators are seeking to establish if at all any amount of money was taken from the house of the slain businesswoman and possibly trace persons who could be in possession of the money. He argued that the suspects who denied the murder charge when they took a plea on Monday were capable of instilling fear on key witnesses given the gruesome manner in which Kimani was murdered. According to a charge sheet read to the two by Lady Justice Jessie Lessit of the Criminal Division of the High Court, the offence which violates Sections 203 and 204 of the Penal Code, was committed on September 19. Lady Justice Lessit had deferred the plea-taking on Tuesday last week to allow Maribe undergo a mental assessment before being charged.